Check out our reviews and see what people are saying about us here at Fourlane Ford! Thank you for taking the time to visit our site! Please feel free to browse our online showroom and come and visit our dealership in Innisfail Alberta where we have a very large selection of new and used vehicles! We are located in Innisfail, Alberta just 15 minutes south of Red Deer on Highway 2 between Calgary and Edmonton. Owned and operated by Len & Jeff Denham, we have been in buisness since May 1993 serving satisfied customers! When we say we are here to serve you, we really mean it! 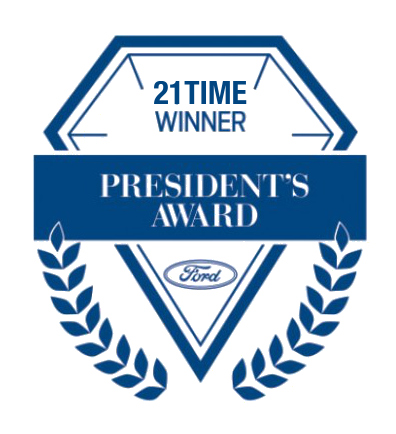 We have won the prestigious Ford president's award 22 times which means we are consistently among the very best in sales and service satisfaction! Come on down to Fourlane Ford where we are "Easy to get to and Easy to deal with!" Please note that our Parts and Quick Lane Service departments are closed on long weekend Saturdays.